Recent results from trials with Polysulphate in soybean in Brazil have shown a significant increase in productivity and profit. Piraju in the south eastern region of Sao Paulo, Brazil, is a major soybean production area but yield potential is not always reached. Growers are interested to find solutions to gain the missing growth and profit. Working with Fertipar Bandeirantes, the southern Brazilian branch of this national fertilizer company, International Potash Institute Coordinator for Latin America, Fabio Vale, coordinated the field scale trial of Polysulphate blended fertilizer. The blend with Polysulphate added was compared with a local high quality blend. Soybean yield increased with the Polysulphate blend fertilizer by 18% compared with alternative fertilizer. Root development was clearly deeper and more vigorous (See below). Significantly, the Polysulphate blend fertilizer costs no more than the alternative so the increased yield has a beneficial effect on the bottom line with a 20% increase in profit. 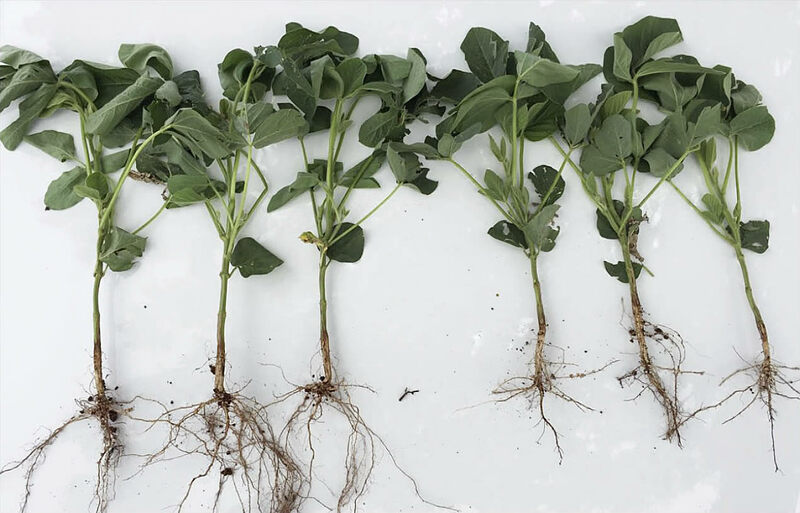 Root development in soybean plants grown with Polysulphate (left) is more vigorous than those grown without (right).